I’m Charlie Nardozzi and this is the Vermont Garden Journal. Pears are an ancient fruit. There’s evidence that pears were known to prehistoric people’s living in Swiss caves thousands of years ago. We New Englanders were planting pear trees as early as the 1600’s. While the commercial industry in our country has shifted to Washington and Oregon because of better growing conditions and fewer disease problems, there are still many varieties that we can grow to enjoy these buttery fruits. The key with growing pears is finding the right variety and proper growing conditions. While traditional varieties, such as ‘Bartlett’ and ‘Bosc’, can grow in warmer parts of the region, in colder areas look for varieties such as ‘Luscious’, ‘Patten’, ‘Waterville’, and ‘Summer Crisp’. ‘Summer Crisp’ can be eaten like an Asian Pear while it’s still firm. Pears need at least two different varieties to pollinate the flowers. One reason pears don’t fruit well is poor pollination. Pear nectar has only about 10% sugar, compared to apple nectar with 50% sugar, so they’re not as attractive to honey bees. Pears grow best on well-drained, fertile soil. However, they’re more tolerant of cool, clay soils than apples. Although pears may take 3 to 5 years to start bearing fruits, they can produce for 40 years or longer. Pears don’t need as much pruning as apples. Just remove dead, broken or diseased branches and thin out branches that are overcrowded. Crowded branches can lead to poor air circulation, wet leaves and fire blight disease. Select fire blight resistant varieties such as Luscious’ and ‘Moonglow’ if it’s a concern in your yard. 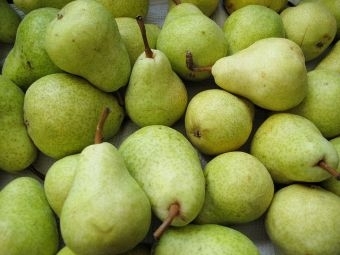 Pick pears when they’re firm, but not ripe. They need to ripen off the tree. You’ll know it’s time to eat your pears by checking the neck. If it gives when you press your thumb on it and the neck is ripe and juicy, the pear is ready to eat. Now for this week’s tip, it’s back. Late blight has been reported on tomatoes in Jericho, so scan your tomato and potato plants for signs of this disease and pull and destroy infected plants. Next week on the Vermont Garden Journal, I’ll be talking about hibiscus. For now, I’ll be seeing you in the garden! A squirrel population boom is menacing fruit growers in some patches of the country, including Vermont.